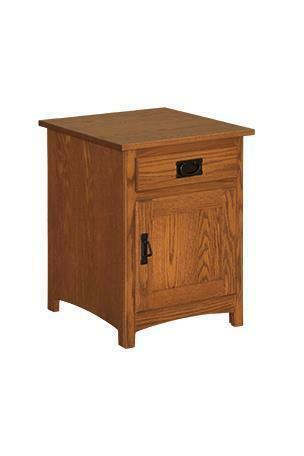 Our Amish Family Mission End Table is ready to give you and your family easy access to drinks, coasters, remotes, books, blankets, lovies, and more thanks to a drawer and door. Other standard features of this piece include a rectangular design with gentle arches near the base, and a glass-paneled door. Custom options include a wood door, wood type, finish, and hardware.